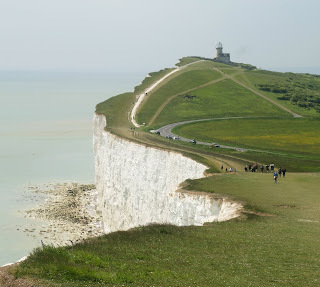 The tall chalk cliffs with 7 peaks that are spreading along the coast in Sussex, south east England. Our journey started in Eastbourne, in front of their famous pier, crowned with majestic pavilion from 19th century. Walking on the sea promenade we reached the end of the coastal town and started our way upwards trough beautiful meadows that soon offered some amazing views. After some more ascents, we've reached the lighthouse of Belle Tout and soon there was top of the first sister. The glimpse of magnificent walls, almost white in their colours, spreading kilometres by the sea, with edges cut of sharply was one of the kind. Covered in green, with fences for sheep on one side and verticals of fall to the grey blue sea on the other, we've passed them all, one sister at the time. Even I've succeeded to do so, despite my obvious lack of proper camping equipment, replacing backpack with few bags (one of them golden), sleeping bag with big duvet and my white shoes turning somehow green. Ending by the Cuckmere Haven on the west, we've soon reached our camping site for the night. After successfully beating all the camping struggles, such as 'how to put up multilayered tent' and 'how to convince a really awful gas cooker to function', we've spent a very pleasant evening outside, hidden between nature and hills. My friend prepared us some delicious vegetable spaghetti and so we began our night under the stars.